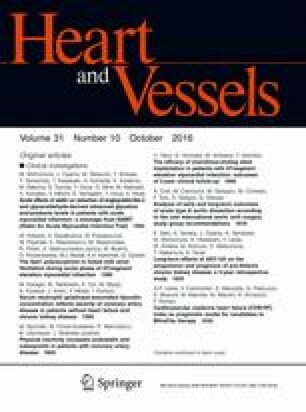 A subgroup of patients with Marfan syndrome (MFS) who have mutations in exons 24–32 of the FBN1 gene manifests severe atrioventricular valve insufficiency and skeletal problems as early as the neonatal period. These patients usually die in the first 2 years of life, thus a region between exons 24 and 32 of FBN1 is recognized as a critical region for this neonatal form of MFS (nMFS). Here, we report five consecutive patients who manifested a cardiovascular phenotype until infancy with mutations in the critical region for nMFS. Although three of these patients showed severe mitral regurgitation and died before reaching 1 year of age, the remaining two patients survived for over 5 years under medical and/or surgical interventions. Two splicing mutations and one missense mutation were identified in the three deceased patients, whereas two missense mutations were found in the two survivors. Currently, the clinical severity of patients with early-onset MFS harboring mutations in the critical region for nMFS seem to be more variable than ever thought, and intensive treatments are recommended even in this subgroup of patients with MFS. We specially thank members of the Center for Medical Genetics, Keio University School of Medicine for their molecular analysis of FBN1. We also thank Jun Yasuhara for providing critical comments on the clinical reports.